Users from around the world reinforce importance of cross-media marketing for the printing and marketing industries. DirectSmile User conferenceJust over 100 EFI™ DirectSmile cross-media customers assembled on the 27-28 August in Berlin, Germany for the first ever EFI DirectSmile user conference. 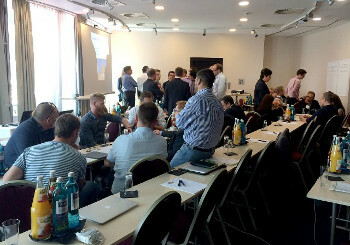 EFI confirmed that users from 15 countries across three continents met to share ideas, find inspiration and get insights for the development of their cross-media business, as well as gain in-depth technical know-how on the solution. Additionally, DirectSmile users also had the opportunity to give feedback on the current and future development of the software. Among them were printers, advertising agencies and marketing service providers. Clothilde Vazeux from Swiss publisher Stämpfli said, "It was simply fantastic! It was enriching to meet so many professionals from all over Europe that work on the same topics as we do. I will keep contact and profit from a strong network of specialists. This conference has to happen again." Tobias Flores, conference chairman echoed those sentiments. "It is absolutely amazing, that even after just a few hours you saw customers from Sweden talk to users from the US, and French users to people from Singapore, all who never met before," he said. “This is exactly what we wanted to achieve-turn individual cross-media users into a true community." The first day of the event included seminars on the latest EFI DirectSmile software as well as on the changing media landscape. Keynote speaker, Magnus Kristiansen, a user from Norway proved to be a special highlight, giving fresh insights into the new requirements all communication providers are facing today. On the second conference day, users could choose between in-depth technical expertise in the Cross Media Campaign Lab, including how to build a Facebook application, or they could join the Business Track on selling and marketing cross-media campaigns. During this session, EFI DirectSmile users Manfred Senn from Mapro in Switzerland, and Mikael Kuniholm from EO in Sweden shared case studies from their regions. Christoph Clermont, director of engineering at EFI DirectSmile commented, "The demands of our customers are so diverse because their campaigns made with our solution are so diverse. Listening very closely to what our customers say is absolutely essential for the decisions we take for the future development of the software." Lucy Swanston from British advertising agency Nutshell Creative added, "For me, it was a validation that we are taking our business in the right direction. Talking to so many industry peers, I'm more convinced than ever that there is a huge demand for multi-channel communication and there´s just one platform that does it, and that´s DirectSmile." Filip Buyse, general manager of EFI Web-to-Print Solutions said, "We received a very positive response from DirectSmile users about the value of the EFI DirectSmile VDP and cross-media solutions and how they are driving growth and expansion for their business. It is testimony to EFI's strategy to bring more value to marketing service providers, from ad agencies to print service providers." Connect 2015 will take place at the Wynn Hotel, Las Vegas, 20-23 January. For more information or to register, please go to www.efi.com/Connect.